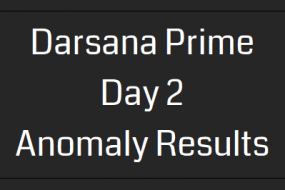 Day one of the EXO5 Anomaly Series saw a tight battle between the two factions with only half a series point separating the two teams by the end of the day. 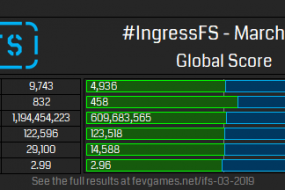 During phase one in Osaka, the Resistance and Enlightened waged a fierce battle between each other but the Enlightened gained the upper hand scoring 53.3% in portal captures compared to the Resistance’s 46.69% . At the third measurement of the second phase, the Enlightened dominated the playing field scoring 158 points in shards over the Resistance score of 88. Their determination carried over into the third phase, scoring 82.02% of the links made for the phase. The total points earned in Osaka were 100.44 for the Resistance and 199.56 for the Enlightened, gaining a win for the Enlightened. In Cebu City, the Enlightened dominated this round and in each phase. They scored 82.35% of portal captures in phase one compared to Resistance’s score of 17.65%. In phase two they scored all but one point in shards and in phase three they overwhelmed the board with links by 98.86%, only allowing the Resistance to score six links in the entire phase. Total points earned by the Enlightened were 277.22 to 22.78 for the Resistance, bringing the Enlightened another win for the anomaly. In Chennai the Resistance and Enlightened scores were the closest of day one. The Resistance worked hard to keep control over the portals and volatiles during the first phase, scoring 71.67% over the Enlightened score of 28.33%. The Enlightened came back fighting in phase two, scoring 19 points in shards to beat the Resistance score of 17. However the Resistance came back during the third phase to gain control of the rest of the day. Chennai ended with the scored points of 201.63 for the Resistance and 98.37 for the Enlightened, gaining a win for the Resistance. In Berlin, the Resistance were determined! During the first phase the Resistance scored 60.29% of the portals compared to 39.71% of the portals scored by the Enlightened. In phase two the Resistance once again claimed victory in shards scoring 203 points in shards compared to the 90 points made by the Enlightened. In the final phase the Resistance controlled 83.96% of links while the Enlightened controlled 16.04%. The day ended with the Resistance winning Berlin with 213.53 points and the Enlightened at 86.47. In Zagreb both teams were adamantly defending their portals. Phase one was close with the Resistance scoring 56.04% of the portal and volatile captures compares to the Enlightened score 43.96%. During phase two the Enlightened fought hard scoring 8 points in shards, just one point over the Resistances score of 7. The Resistance did not back down and in the third phase they took over, scoring 84.57% of the links made and winning Zagreb with a final score of 187.28 points over the Enlightened score of 112.72 points. In Boulder, the Enlightened once again dominated another site. In phase one, they scored 61.26% of the portals captured compared to the Resistance’s 38.74% and in phase two they scored 43 points in shards overwhelming the Resistance’s 3 points. In phase three, they didn’t let up, making 92.08% of the links for the phase and only allowing the Resistance 7.92%. The Enlightened won Boulder with 246.82 points, the Resistance scoring 53.18. In Panama City, phase one was close with the Enlightened scoring 57.69% of the portal and volatile captures and the Resistance scoring 42.31%. However, in the second phase the Enlightened pulled further ahead scoring 70 points in shards, over double the amount of points the Resistance scored at 30. By the third phase the Enlightened was on fire, winning the phase by 90.79% and carrying the win for Panama with 218.48 points as their final score compared the the Resistance score of 81.52. The smallest event of the day was in Houston where there was only six Phase 1 Measurements followed by an unscored GORUCK event. The first measurement was the highest scoring for the Resistance giving them 60 points while the Enlightened fought through the measurements to make the last one the best for them giving them 109. As a result, the final score was 64.5 for Enlightened and 35.5 for Resistance. 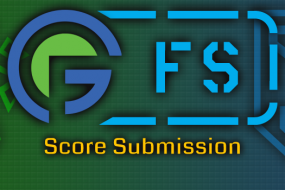 We hope you enjoyed the updated scorecard styles and the brand new shard tracking GIFs! Let us know your feedback in the comments section below. We’ll see you again after day 2 of EXO5 in December!